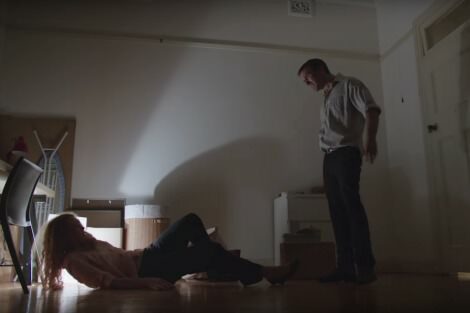 The federal government's new ad aims to 'stop violence from the start'. It sends a strong message that violence is never acceptable. But it firmly positions domestic violence as a problem of individual attitudes of perpetrators, not the social and economic vulnerability of victims. The title and the message of the ad is 'Respect'. It is premised on an increasingly influential idea of domestic violence as an expression of individual and cultural devaluing of women. It aims to raise awareness of the potential long-term consequences of seemingly minor acts of disrespect. Even in the recent history of domestic violence debate, this message is an important step forward. But envisaging an end of domestic violence achieved through 'starting conversations about respect with boys and girls' sidesteps the need for the material resources necessary to stop violence when it happens. Physical violence is the obvious and most derided act of violence in intimate relationships. But it is an expression not only of disrespect, but of power disparities between partners. Violent partners can control women's access to jobs, money and social supports. When women leave, they need meaningful financial support to rebuild their lives. The funding failures of the Turnbull government are legion. The $100 million in funding announced in September last year does not come close to replacing funding lost in earlier cuts, nor can it address the service gaps in the sector. Emergency shelters are essential in keeping women and their families safe when they initially leave violent situations but there is a real shortage of beds and related supports. Community legal centres are one of the few accessible sources of legal advice for domestic violence victims. But with funding cuts, victims will continue to be turned away because of a lack of staffing and resources. The gap between the federal government's shiny rhetoric and the needs of domestic violence survivors is evident in policy domains that impact on the wellbeing of victims. Domestic violence is the primary reason for homelessness among women. Housing affordability is a key step in addressing long-term homelessness, but is absent from the government's agenda in any meaningful way. Many women need money when they leave abusers. The dynamics of control that underpin much family violence increase the likelihood that women will not be financially independent when they leave a violent partner. The parenting payments that are a necessary source of income for many women when they leave relationships is not enough to live with any modicum of comfort or financial security. "Systematic underfunding of the service and community sectors erodes the collective advocacy of organisations that support women and argue for social, political and economic change." The approach to Newstart is punishing. As the recent (currently shelved) Social Security Legislation Amendment (Further Strengthening Job Seeker Compliance) Bill 2015 highlights, the government will support the withholding of payments not only for behaviours, but attitudes that do not conform to the stringent activity, reporting and surveillance requirements placed on job seekers. The place of child support in abused women's financial lives is ambiguous. Women are required to seek child support in order to receive their full entitlements to Family Tax Benefits, but may find themselves subject to ongoing financial abuse. Exemptions from seeking child support are available, but not well advertised. Despite the rhetoric of gender equality and respect for women, the federal government responds to domestic violence as a problem of individual attitudes, to be addressed by responsible individuals. Systematic underfunding of the service and community sectors erodes the collective voice and advocacy of organisations that both support women and argue for social, political and economic change. It denies women who have left their partners the resources needed for social, economic and emotional wellbeing. When women leave a violent situation, they are almost immediately positioned as 'leaners', through the practical effects of government policy. The message in this new ad echoes Turnbull's 'game changing' comments about respect for women. But there is nothing game changing about demanding respect without funding the resources needed to protect women when that respect goes missing, as it so often seems to do. Kristin Natalier is an associate professor in sociology at Flinders University. Wonderfully perceptive with no arguments possible on each point.Let us hope this message reaches the government Mercury winged and policies change to reflect "a really exciting time" in the lives of these vulnerable women and children." While you address many fundamental issues around domestic violence your views assume all domestic violence victims are financially bereft. This is not always the case, and for those of us that are the 'breadwinners' (so to speak) the consequences of domestic violence can be even more profound as the male partner is doubly threatened by potential loss to a lifestyle they couldn't afford on their own. In addition immediate barriers arise in terms of access to domestic violence support including and especially legal advice as it is 'assumed' we can afford to pay because we are working and live in a area where 'domestic violence couldn't possibly take place'. Wrong on both counts. Don't assume all domestic violence victims are 'underprivileged' or not well educated. Prof Kristin Natalier reminds us yet again of the costs to be born by the least powerful and resourced in the wake of government policies that divert vital social expenditure - in this case from women escaping violent homes - to other capital interests of the more powerful and resourced like those who will build the new French designed submarines without even asking the vital question: why submarines? what do we want them to do for us? We should also critique seriously the government's 'Respect' response to the ever increasing incidence of family violence in Australia - especially when that response recruits 'role model' advocates from two of our football codes which have become themselves inherently violent on the field. The incongruence will be obvious to those who suffer violence. Still, to challenge the attitudes and behaviours of those who use violence against intimate partners and children is essential - though only two corners of the trinity of male violence. The missing corner of course is the yet unchallenged and deeply gendered emotional socialisation of boys and men. As a practitioner, researcher and author of some 30 years in the field of men, anger and violence, I can tell you first that most physically violent attacks against intimate partners (male and female) are done while the perpetrator is enraged - not offered as an excuse, by the way. The point being that men are socialised from early childhood to hide or suppress emotions like fear, sadness and hurt - all considered unmanly. They are often left emotionally crippled, dependent on anger to express those 'unmanly' emotions. Violence prevention has to be the aim of public policy because the alternative is both unaffordable and ineffective. Therefore it is way past time we began to challenge the gendered emotional socialisation of men - at home, in school, in sport & business, in the workplace and in politics. A good starting place might be the national and state parliaments of our country, where much of the behaviour, attitudes and emotional expression is of the aggressive, threatening and intimidatory nature of our highly masculinised society.